Was born in Taiwan and has lived in Malaysia, Singapore, Brunei and New York City. He currently resides in SE Michigan. His passion is for cooking. He has owned several restaurants in Michigan. Chef Tom specializes in Chinese, Thai and Japanese cuisines. 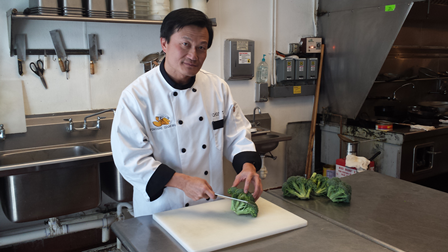 He has over 30 years of experience making delicious Asian inspired food. Chef Tom is also a culinary instructor and does local appearances that include TV cooking segments, Trade Shows and other speaking engagements. Chef most recently appeared on the Food Network on Cutthroat Kitchen, where he won his episode. He has also appeared on a Guy Fieri cooking competition show and will have another appearance on a special edition series of Cutthroat Kitchen in Spring of 2015. Chef Tom has received many awards and recognition for his cooking and success in the restaurant industry. His goal is to prepare a vast variety of quality dishes that are not only delicious but can be prepared healthfully too. Being a natural at teaching (he has trained over 300 chefs), he wants to be able to share his knowledge and cooking skills. In addition, Chef has a vast knowledge of the Asian culture and has anecdotal explanations and stories that tie into his food. A true pleasure to watch Chef Tom at what he does best!